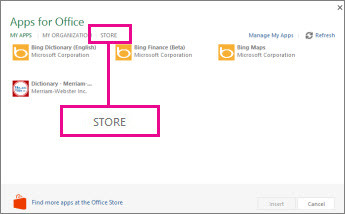 Office add-ins can help you personalize your presentations or speed up the way you access information on the web. For example, with an add-in you could look up items on Wikipedia or add an online map to your presentation without having to leave PowerPoint. 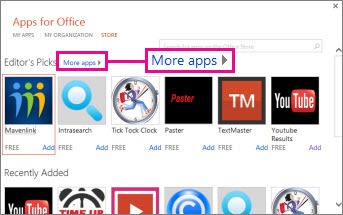 Important: The new name for "apps for Office" is "Office Add-ins." 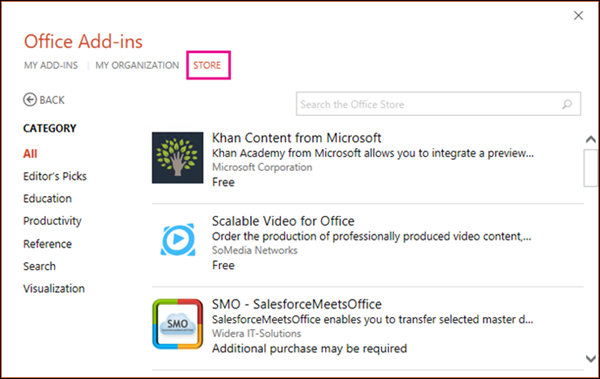 We are currently updating our products, documentation, samples, and other resources to reflect the platform name change from "apps for Office and SharePoint" to "Office and SharePoint Add-ins". We made this change to better distinguish the extension platform from Office apps (applications like Word, Excel, and PowerPoint). While these changes are taking place, the dialogs and messages you see in your application might be different than what you see in this article. This information applies to PowerPoint 2016, PowerPoint 2019, and PowerPoint for Office 365. 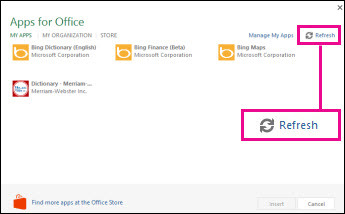 You can use the web Office Add-ins in newer versions of PowerPoint. Pick the add-in you want, or search for one in the search box. When you find an add-in you want, click it. If you’d rather browse the whole store, click All or See more. Click an add-in to read more about it, and then click Add or Buy. If you’re prompted to sign in, type the email address and password you use to sign in to Office programs. Review the privacy information, and then click Continue (for free add-ins), or confirm billing information and complete your purchase. To start using your add-in with PowerPoint, double-click it in the add-ins list. 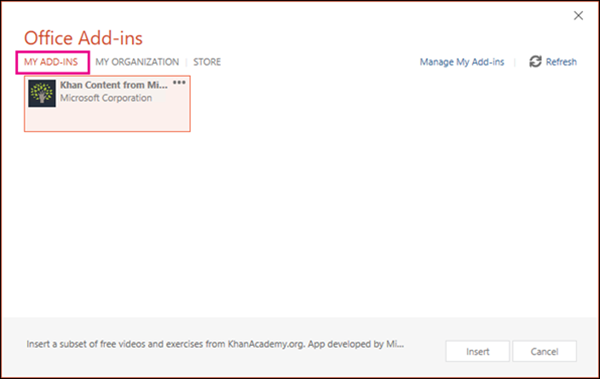 Double-click any add-in from the My Add-ins group in the Office Add-ins dialog to start using it. You can also select the add-in and then click Insert to start using the add-in. Note: After you get a new add-in, it should show up in your add-ins list. If it doesn’t, click Refresh to update the list. 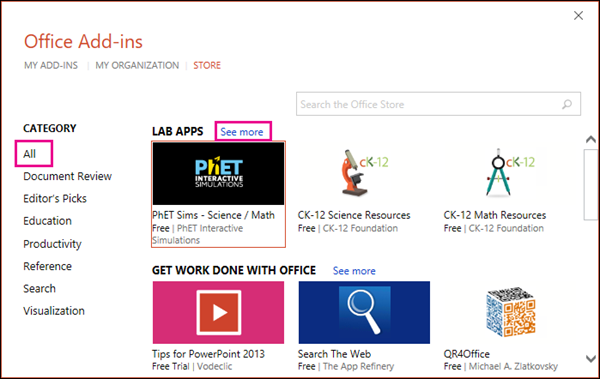 The dialogs and other messages you see in PowerPoint 2013 currently show "apps for Office" for the add-ins based on the web technologies provided by the new Office Add-ins model. These dialogs and messages are changing to "Office Add-ins." Pick the app you want, or search for one in the search box. When you find an app you want, click Add or Buy. If you’d rather browse the whole store, click More apps. Click an app to read more about it, and then click Add or Buy. If you’re prompted to sign in, type the email address and password you use to sign in to Office programs. Review the privacy information, and then click Continue (for free apps), or confirm billing information and complete your purchase. Double-click any app to start using it. Note: After you get a new app, it should show up in your apps list. If it doesn’t, click Refresh to update the list.